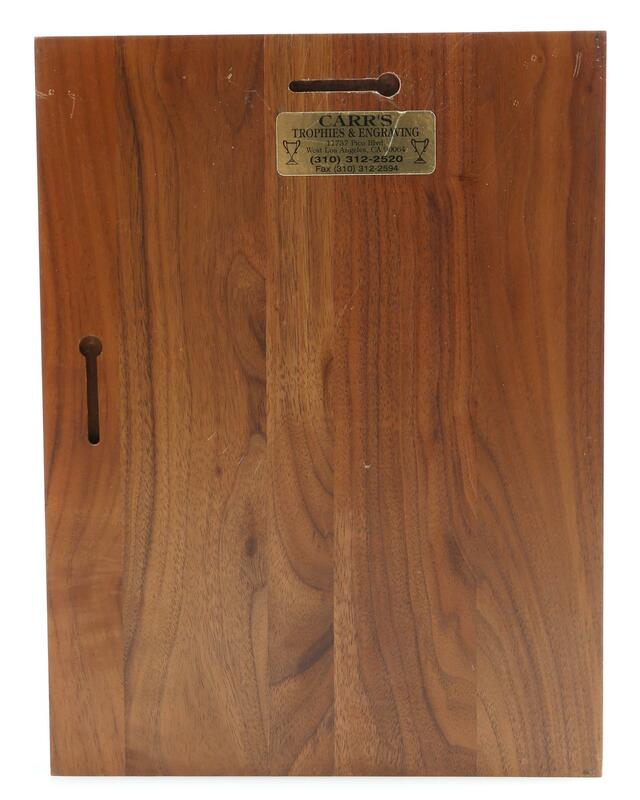 TV Treasures Live Auction (#125) 12/01/2018 10:00 AM PST CLOSED! 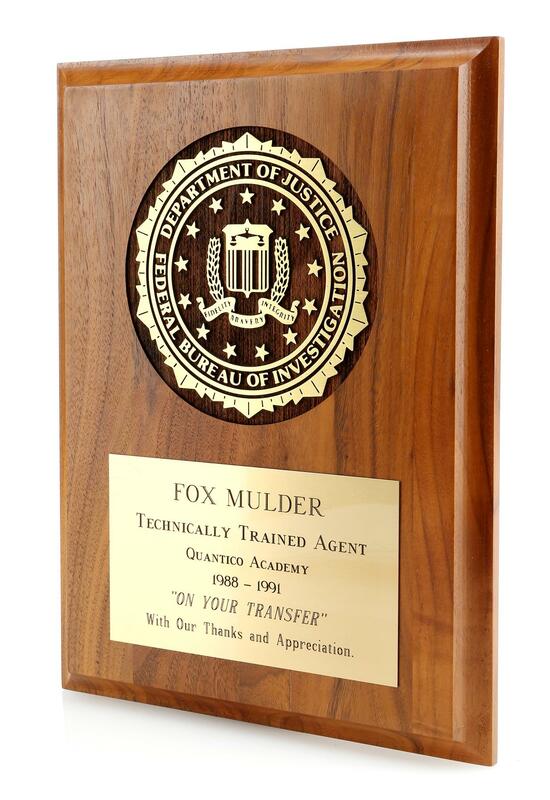 Agent Fox Mulder's (David Duchovny) FBI 'Technically Trained Agent' plaque from the sci-fi drama series The X-Files. 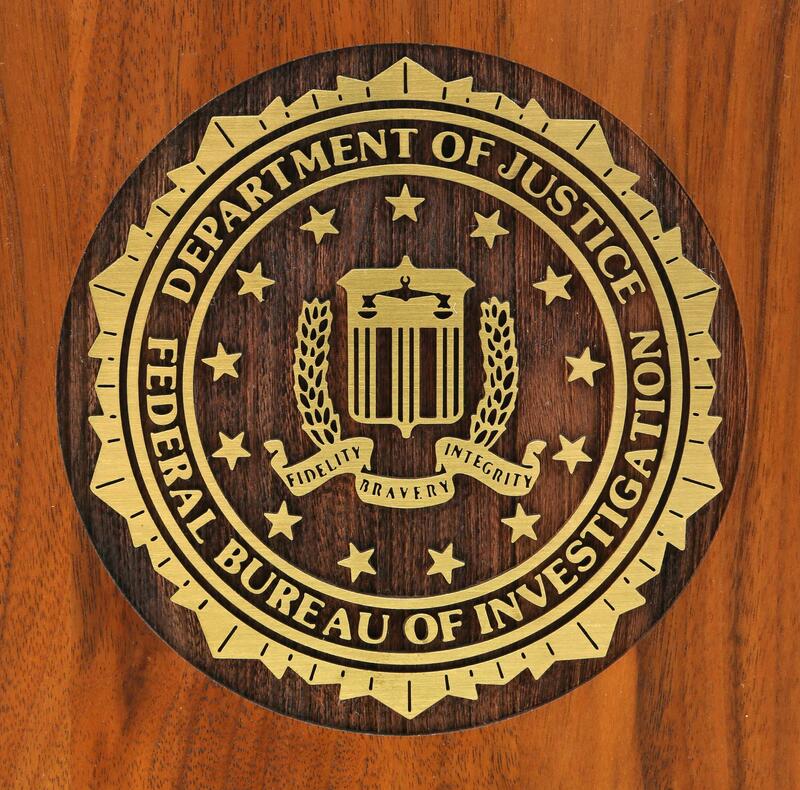 The ‘Department of Justice Federal Bureau of Investigation’ logo is laser cut into the wood plaque. 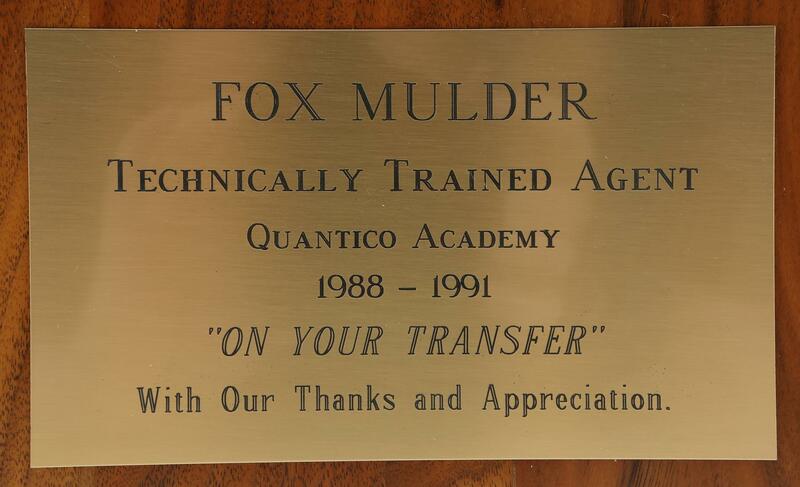 An affixed brass plate reads ‘Fox Mulder - Technically Trained Agent - Quantico Academy 1988-1991. 'On Your Transfer With Our Thanks and Appreciation’. The plaque exhibits some signs of use, but remains in very good, production-used condition overall. 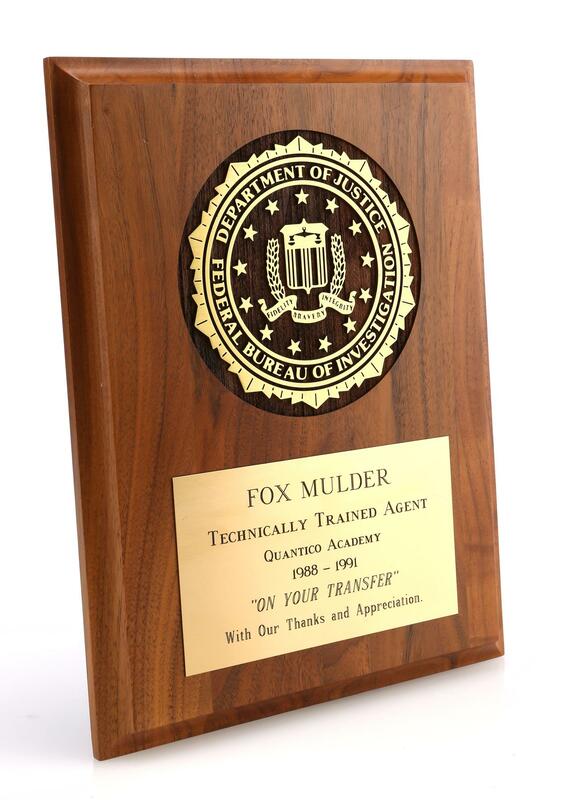 The plaque appears as set decoration in Mulder’s office throughout the series. 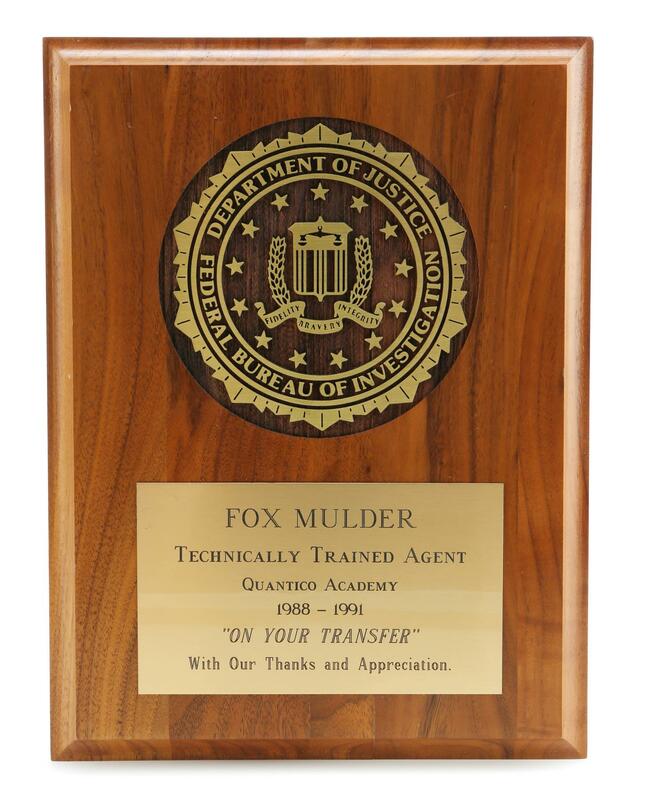 This item comes with a Prop Store Certificate of Authenticity co-signed by auction curator James Comisar. The auction is being held live in Valencia, CA on December 1st at 10am PST. Bidding can be done in person, via Prop Store’s online auction platform, or telephone. Payment plans for Payment plans for lots in this auction are available by specific request only and must be approved in *advance* of bidding; please contact Prop Store for additional details. Any customers not approved for payment plans *before* the auction must settle their invoices in full within 7 business days from receipt of the invoice. Buyer’s Premium of 25% will be added to all winning bids. Certain Lots in this auction are sold without a Reserve Price; the majority of Lots in this auction are sold with a Reserve Price. The Reserve Price is the minimum price the Seller will accept for a Lot. The Reserve Price will not be more than the lowest estimate given by Prop Store. Prop Store may disclose or keep confidential the Reserve Price at its entire discretion. Key auction lots will be staged for public viewing prior to the auction. The viewing offers an opportunity to examine lots in person, register for the auction, and speak with Prop Store staff about the material and the auction. Lots not staged at the viewing can be viewed by appointment; lots can also be previewed prior to the public viewing by appointment Please email us to schedule a viewing appointment. The Buyer is solely responsible for all shipping, handling, and delivery costs. Prop Store can help you arrange packing and shipping through FedEx for smaller items or PackAir Airfreight, Inc. for larger items, or you can use your own licensed carrier, approved by Prop Store. Customers are strongly advised to request a shipping quote prior to bidding. Email our shipping department and we will aim to provide you with a comprehensive shipping quote within 1 working day, though freight quotes for oversized items may take longer. Please be advised that certain Lots are highly fragile and should be handled with caution. Prop Store recommends that the Buyer collect such Lots locally from Prop Store if possible. Special Note: Payment Plans for lots in this auction are available by specific request only and must be approved in advance of bidding; please contact Prop Store for additional details. When the following These Terms and Conditions of Sale (“Conditions”) set out the legal relationship between the Bidder/Buyer and Prop Store and the Seller. By registering to bid and participate in a Prop Store Auction, you will be deemed to have read and agreed to be bound by these Conditions and the accompanying Buyer’s Guide, as set forth in the catalog for the Auction and online at propstore.com. 2.1. Prop Store’s staff are not professional restorers so descriptions of Lots, images and statements of condition in Prop Store’s catalog or on its website are for illustrative purposes only. Prop Store cannot guarantee that colors are properly shown. Save for Prop Store’s Terms of Guarantee of Attribution, all Lots are sold “as is.” Bidders are encouraged to inspect Lots and satisfy themselves as to their condition before bidding, seeking and obtaining independent professional advice where required. 3.1.2. To register, each person or Company must complete and return a bidder registration form available on pages 353-354 of this catalog or online at propstore.com, which must include a valid Visa, MasterCard or American Express credit card details to be held on file. 3.1.4. Each Company registering to bid must provide a certified copy or original articles of incorporation, articles of organization, or other documents satisfactory to Prop Store – contact Prop Store at +1 818 727 7829 for confirmation of what will be acceptable. enquiries@propstore.com or by phone +1 818 727 7829 if you do not wish for your information to be used for such a purpose). shippingla@propstore.com including the Lot number and shipping address at least 3 days before the start of the Auction. Real-time shipping estimates are also available on many lots through the online bidding platform. 4.1.1 Certain Lots in this auction are sold without a Reserve Price; the majority of Lots in this auction are sold with a Reserve Price. The Reserve Price is the minimum price the Seller will accept for a Lot. The Reserve Price will not be more than the lowest estimate given by Prop Store. Prop Store may disclose or keep confidential the Reserve Price at its entire discretion. 4.2.3. When making a bid, every Bidder acknowledges that such bid is a binding offer to buy the Lot at that price (plus the Buyer’s Premium, all applicable taxes, and any and all shipping charges, storage fees and/or other costs). 4.2.5. The auctioneer may accept bids from Bidders present in the sale room, via telephone, or via online at the time of the Auction. The auctioneer may also accept proxy or absentee bids delivered to Prop Store before the start of the Auction. Proxy or absentee bids must be submitted either by using the form in the Buyer’s Guide or the online form at propstore.com. Proxy or absentee bids will be executed at the lowest possible price. If Prop Store receives proxy or absentee bids on a particular Lot for identical maximum bids, and at the Auction these are the highest bids on the Lot, it will be sold to the Bidder whose written bid was first received by Prop Store. 5.2.2. If any applicable conditions herein are not complied with (to a material extent), the Buyer will be in Default and in addition to any and all other remedies available to Prop Store by law, including, without limitation, the right to hold the Buyer liable for the total Purchase Price, including all fees, charges and expenses more fully set forth herein, and as set forth in section 4.2 herein, Prop Store, at its option and to the extent permitted by law, may (i) cancel the sale of that, or any other items sold to the defaulting Buyer, retaining as liquidated damages all payments made by the Buyer, (ii) resell the purchased item, or (iii) effect any combination thereof. In any case, the Buyer shall be liable for any deficiency, any and all costs, handling charges, late charges, expenses of both sales, legal fees and expenses, collection fees and incidental damages. 5.2.4. Prop Store may further reject at any future auction any bids made by or on behalf of the Buyer or to require a deposit from the Buyer before accepting any further bids. 5.3.1. The Buyer is solely responsible for all shipping, handling, and delivery costs. Prop Store can help you arrange packing and shipping through FedEx for smaller items or PackAir AirFreight, Inc. for larger items, or you can use your own licensed carrier, approved by Prop Store. Please contact Prop Store at +1 818 727 7829 or shippingla@propstore.com for further details. Please be advised that certain Lots are highly fragile and should be handled with caution. Prop Store recommends that the Buyer collect such Lots locally from Prop Store, if possible. Prop Store does not warranty the Lots against and shall have no liability for any damage that any Lot may incur or suffer during the shipping or delivery process. 6.1. Prop Store warrants the attribution of each Lot as stated in the title block (film title and item title) of that Lot in the Auction catalog, subject to any revisions (which may be given in writing or online before or during the Auction at which the Lot is purchased by the Buyer); this is Prop Store's Guarantee of Attribution. Buyers should be aware that multiple examples of props and costumes are frequently used during production and it is often impossible to determine whether a specific piece has been used on-camera. Any specific on-camera usage known to Prop Store will be noted within the description, but no warranties are given by Prop Store on that description. 6.3. In the event a sale is rescinded in accordance with condition 6.2, Prop Store shall repay to the Buyer the Purchase Price. Repayment of the Purchase Price shall be the Buyer’s sole remedy for an incorrect Guarantee of Attribution, to the exclusion of all other remedies to the extent permissible at law. It is specifically understood that this will be considered the Buyer’s sole remedy under this clause 6. 7.1. The copyright in all images, illustrations and written material produced by or for Prop Store relating to this auction, is and shall remain at all times the property of The Comisar Collection. The purchase of these items does not include ownership in or to the trademarks registrations, copyrights and/or any other intangible intellectual properties associated with this item. Therefore purchase of this item does not permit the Buyer to replicate or to exploit this item otherwise. The Buyer agrees to indemnify and hold harmless Prop Store and its directors, employees, affiliates, contractors and agents from any third-party claims, actions, suits, judgments, losses, damages, costs and expenses (including reasonable attorneys’ fees) asserted against or incurred by Prop Store that arise out of or result from any act or omission by the Buyer arising out of or relating to the Buyer’s infringement of any copyrights or trademarks in or to the items or images. 7.4.1 Items in this sale contain electronic components. While every effort has been made to describe them accurately, no guarantee or warranty is made as to the functionality, lifespan or safety of those components. It is entirely incumbent on the new owner to satisfy themselves as to their safe use and maintenance. 7.9. Prop Store and the Consignor make no representations or warranties, express or implied, regarding the Property or that the Property is in compliance with any applicable city, state or federal laws or code, including, without limitation, any warranties imposed by law, whether now known or hereafter enacted, and any such representations and warranties, express or implied, are hereby expressly disclaimed. Buyer acknowledges and agrees that buyer is aware of actual and/or potential damage to any items prior to purchasing any Property in the auction and buyer agrees to assume all risks associated with the Property, including, without limitation, any patent or latent defects or consequential damages buyer may suffer as a result of the ownership of the Items. No buyer of the Property may use the Property for a commercial purpose and buyer shall be liable for any claims arising out of such use, including but not limited to claims relating to rights of privacy, rights of publicity, defamation, copyright infringement, or trademark infringement. Buyer acknowledges and agrees that buyer is not receiving any transfer of copyright, trademark or other intellectual property right from Prop Store, the Consignor, or their respective successors or assigns in the Property, all of which are specifically reserved by the Consignor. PROP STORE AND THE CONSIGNOR EXPRESSLY DISCLAIM THE IMPLIED WARRANTIES OF MERCHANTABILITY AND FITNESS FOR A PARTICULAR PURPOSE AND THEIR EQUIVALENTS UNDER THE LAWS OF ANY JURISDICTION REGARDING THE PROPERTY. IN ADDITION, PROP STORE AND THE CONSIGNOR MAKE NO REPRESENTATION, GUARANTEE OR WARRANTY WITH RESPECT TO THE CONDITION OF THE PROPERTY OR THAT THE PROPERTY WILL BE FUNCTIONAL AND EXPRESSLY DISCLAIM ALL SUCH REPRESENTATIONS, WARRANTIES AND GUARANTEES. MOREOVER, NO MANUFACTURING WARRANTIES, IF ANY, SHALL SURVIVE THE SALE OF THE PROPERTY. 8.1. If any part of these Conditions is found by any arbitrator or court of competent jurisdiction to be invalid, illegal or unenforceable, that part shall be discountedand the rest of the Conditions shall continue to be valid to the fullest extent permitted by law. 9.1.5. inform the Bidder about important auction updates.